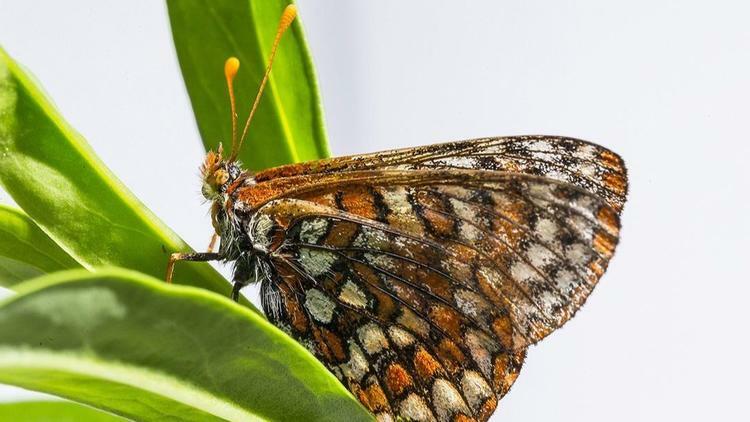 The endangered Quino Checkerspots (Euphydryas editha quino) are flying on the San Diego National Wildlife Refuge this spring for the first time in years. It selectively lays its eggs only on the Dwarf Plantain plant. Once found throughout California and into Mexico, the tiny Quino Checkerspot butterfly population is now extremely fragmented, which made it challenging for San Diego Zoo and U.S. Fish and Wildlife Service biologists to find and collect eggs, larvae and butterflies for the recovery program. Due to the unique biology of this butterfly species, there have been many years when almost no Quino sightings were recorded. As climate change, drought and development have altered their habitat, the Quino’s future was bleak. The Zoo’s entomology staff maintains Quino Checkerspot butterflies and larvae at the lab, along with their host plant, Dwarf Plantain—some of which was grown by the Zoo’s horticulture staff. Quino checkerspot butterflies are dependent on the plantain in order to survive. Dwarf plantain is an annual plant that dies back in summer, which signals the butterfly larvae to enter diapause. When the winter rains begin, the larvae break diapause and begin feeding, eventually eclosing in spring. As part of the recovery program larvae were raised at the zoo. Over 700 of them were taken to the wildlife refuge in December, where the insect’s preferred plant, Dwarf Plantain, grows. Biologists returned recently to a hillside in the San Diego National Wildlife Refuge, where they had placed butterfly larvae in specially constructed pods. Success, Quino Checkerspots were flying. The breeding program continues at the zoo in hopes that one day having a self-sustaining population in the wild.